We are starting 2019 off with “Wild Abandon” from Portland-based artist Stephanie Buer. 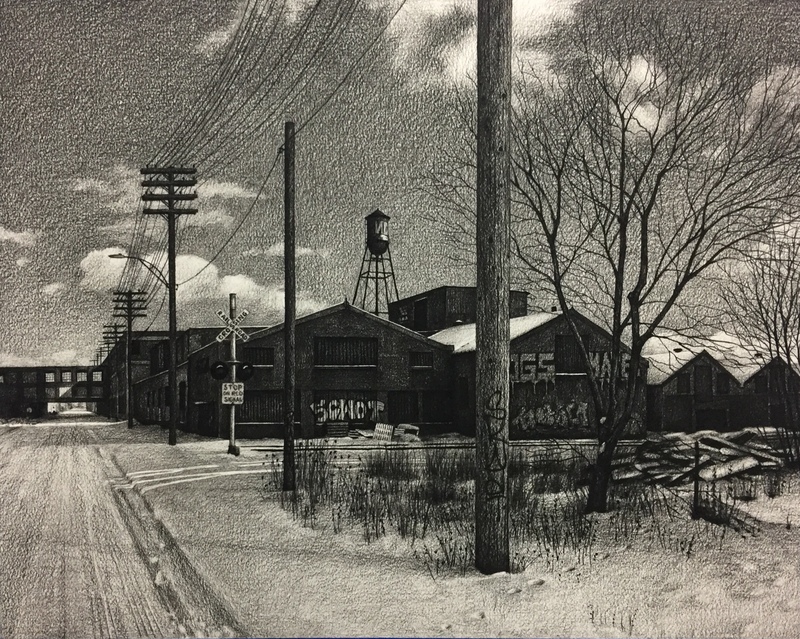 In her latest body of work, Buer returns to Detroit where she explores the city, and shares her finding through photorealistic paintings in oil, and charcoal works on paper. 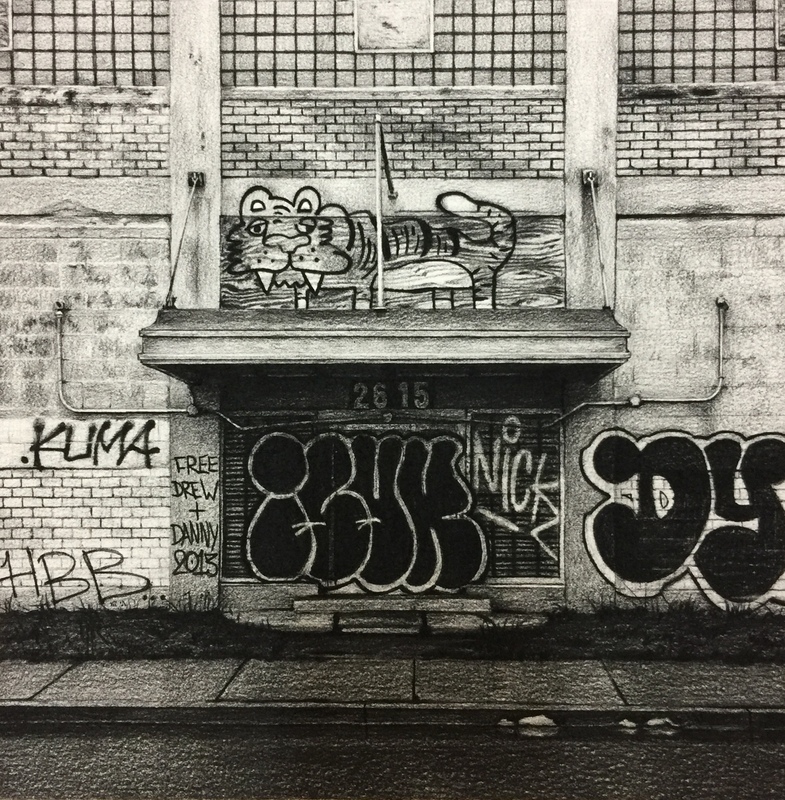 Buer captures the abandoned recesses of the city, finding unexpected richness in its desolation and quietude in its abrupt vacancies. 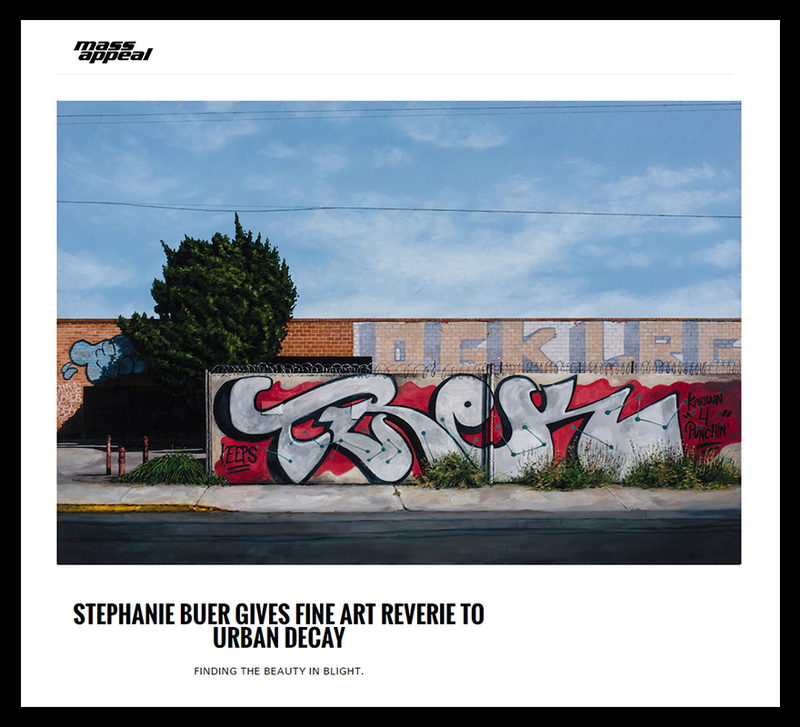 Our interview with Stephanie Buer dives into the inspiration behind this new body of work, what the role of an artist is in society and her dream creative collaboration. SH: For those that are not familiar with you and your work, can you give us a brief look at your artistic background? SB: I spent the majority of my childhood and even into adulthood, training as a classical ballet dancer. So I didn’t start pursuing drawing and painting seriously until College. I went to the College for Creative Studies in Detroit, where I studied drawing, painting and stone carving. Right after I graduated all of my stone carving tools were stolen and at the time they were too expensive to replace, so I started focusing on my drawing and painting. I also worked for many years in car design, while I lived in Detroit, once I saved enough to pay off my student loans, I moved to Portland and started making art full time. SH: What inspired this latest body of work? What buildings and cities did you explore? SB: This body of work was inspired by Detroit, a city I love and called home for 10 years. I had taken a break to explore and make work from other cities and was starting to feel a bit homesick, so I decided to go back home for this one. I was also inspired by the cold, snowy weather. It has been years since a good snowy winter and a winter break trip to see family, have coincided. There has been a lot of warmer winters in the last 6 years or so and I just love painting and drawing snow. It makes me so happy, I couldn’t wait to get out and explore. I was home for two weeks and the temperature was never above 20 degrees. It was so cold one of the days that my camera froze! My closest friend and old college roommate recently bought some property and a small building in Detroit. It’s in a neighborhood that is a bit newer to me, so I spent some time with her getting to know some of the places and buildings nearer to her new home. Spingwells, Del Ray, the Old Continental Motors Factory, Corktown, these are just a few of the locations that I worked from. SH: Is there a particular piece in this exhibition you feel really challenged you? If so, why and what makes you proud of this piece. SB: I usually draw very blank skies, just plain white paper most of the time. I made a larger drawing that had a lot of cloud work in the sky. I know it doesn’t sound like much but it was quite challenging and I think it turned out well. I also tried some new techniques with the painting of clouds too and I think it was successful. I guess I’m proud of the clouds. Sounds a bit silly but I am. SH: Abandon buildings can attract interesting characters and private security, has there been a time where you had to talk your way out of a tricky situation? Is there a particular piece from that moment we can reference? SB: I’ve been pretty lucky, in Detroit, there isn’t a lot of security. Birdman and I had to run and scale a small wall to get away from security in LA once, that was pretty fun. The climbing skills really came in hand. In Detroit its more often very interesting characters that you run into, and I love that. While gathering images for this last body of work, my friend and I were stopped by an older man, taking his son and granddaughter on a tour of the neighborhood he grew up in. This neighborhood, like most in Detroit was lively but desolate, on account of the riots back in the 60’s. His son wasn’t too amused with the tour so he was excited to tell us some stories from his childhood. He told us that Stevie Wonder grew up in the same neighborhood as him and that as a young kid, he used to deliver milk. He was showing us where his house once stood. The drawing, Searching for Stevie Wonder, is that spot. SH: What was the most challenging piece in this exhibition? Why and what did you learn? SB: The most challenging piece was definitely the large painting of the Continental Motors factory. It is the largest painting I have made to date, even building the canvas was a learning experience. I am a big fan of the artist, Rackstraw Downes. He paints a lot of wide-angle landscapes where he exaggerates the curvature of the earth in the horizon and building lines. I wanted to experiment with that and it was very difficult. I find very straight lines and square angles comfortable, they’re easy to make look perfect, but long sweeping, organic lines are so hard to perfect. SB: I love painting and drawing. I get excited to be in the studio every day, even after doing this for so long, it never gets old. Going through new images and planning out pieces and bodies of work is exciting. Trying new techniques is exciting. I like the way that the work helps the viewer to see beauty in things and places where they might not stop to look. I love it! SB: The sustainability and the business side of an art career are the things that frustrate me the most. There’s not much about the creative process that I dislike. Even the tedious bits, like laying in the construction lines or painting hundreds of bricks, I’m even starting to enjoy a bit of framing! Its just the business part of it that I find frustrating. SB: I daydream about collaborating with a choreographer and a dance company. Sometimes my pieces feel to me like the settings on a stage and I wonder what types of movements and costumes someone would dream up to take place on the stages I would create. That’s a super outer space daydream though, never said it out loud before. SB: I think the role of an artist in society has many purposes. It depends on the artist. A few things that I think are important though, are to challenge people, to bring into question the ways we live, and the choices we make. Its also to bring beauty into the world. I would like my work to encourage people to have conversations about what it means to be more present, to be in the moment and observe the world. It’s a societal lifestyle change I see happening and it worries me. I would also like my work to challenge peoples relationship with the environment, to bring attention to our relationship with it and our responsibility to it. I had some great conversations with myself during the making of this body of work, about these points. I love winter, and I love snow, I love being in it, looking at it, capturing it in my pieces. The reality of it though, is that it is rare these days in the midwest. Growing up winters were always cold and snowy but its changing. I know my work is known for focusing on old, dilapidated buildings and graffiti but I wanted these pieces to also showcase the changes we experience with seasons, wintertime, a unique experience to the midwest which I think is not a guarantee these days. It may be something we look back on in a hundred years or so, as a memory. It doesn’t seem like much in capturing it now, but it may be what is most significant about work which artists are making these days. These thoughts definitely inform my life too, they teach me to live a life that is more aware of my impact. Per the earlier point too, I hope making art reminds me to be more present, to put my phone down and to focus on the things that are important. SB: That is an interesting question. There is a lot of snow in these pieces so it wouldn’t be much of a stretch, although, I’m imagining bits of brick and asbestos, some twigs sticking out . . . that’s yucky . . . maybe like vanilla with chocolate and Oreos and other messy looking bits, maybe in a brick patterned waffle cone! A trip! I visited my family in Michigan for the holidays after I finished this last body of work, it was great motivation. A trip to the mountains or some time in the desert climbing is also something I really look forward to. I sacrifice those things in the middle of deadlines so its great to be able to fit them in again. Join us for the opening of Wild Abandon, Saturday, January 5th from 6 – 9 pm. Mass Appeal interviewed artist Stephanie Buer who is currently showing in the Thinkspace Gallery main room. The interview explores Stephanie’s creative process and her choice to document Los Angeles in her latest body of work. Visit the Mass Appeal website for the full interview. 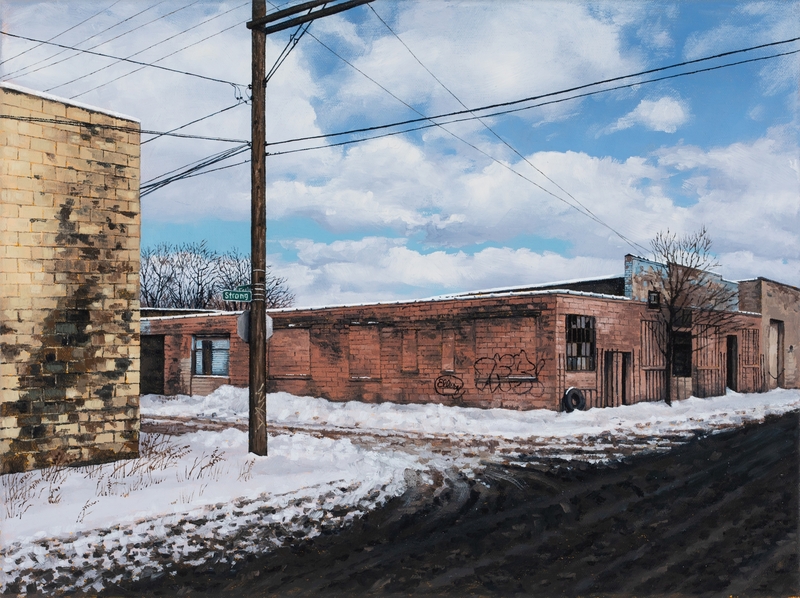 Stephanie Buer’s ‘Uncommon Silence’ is now on view at Thinkspace Gallery, visit the Thinkspace website for more information and to view all available work. Do you consider yourself a documentarian? A storyteller? I would say a documentarian more then a storyteller. 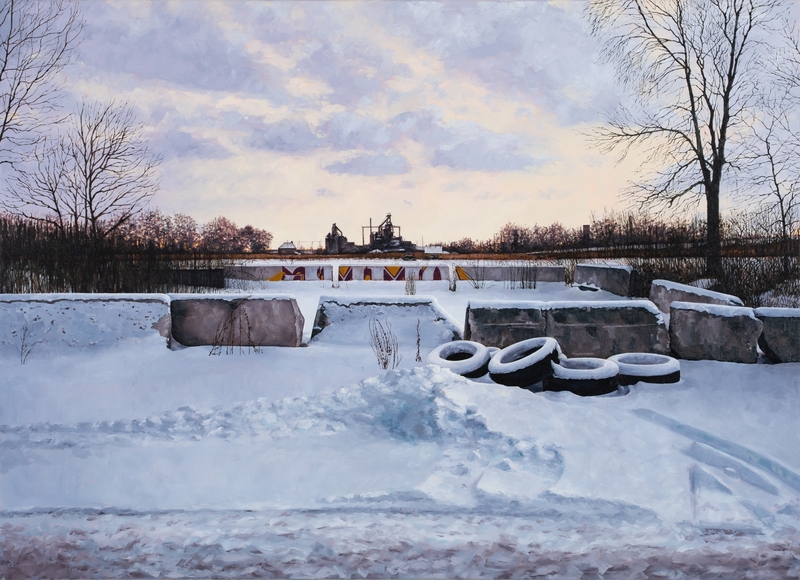 When I started painting these landscapes, I realized that these abandoned and urban spaces change rapidly, either the buildings are torn down, remodeled or continuously repainted. The works capture them in a single moment in time, which will never exist again. I feel like a documentarian when that happens, especially when the buildings are torn down. 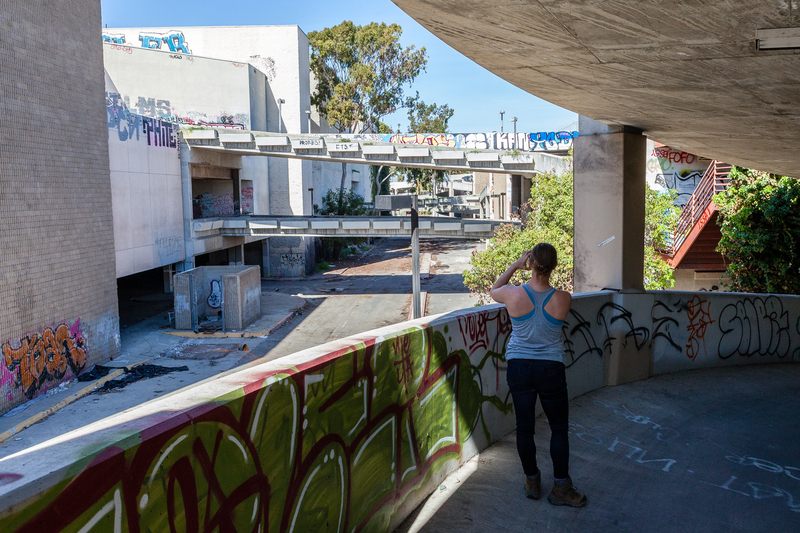 I think all of the work, in its entirety is telling a story about these spaces in our cities but, each individual piece is documenting a particular spot and a particular moment in that place’s existence. 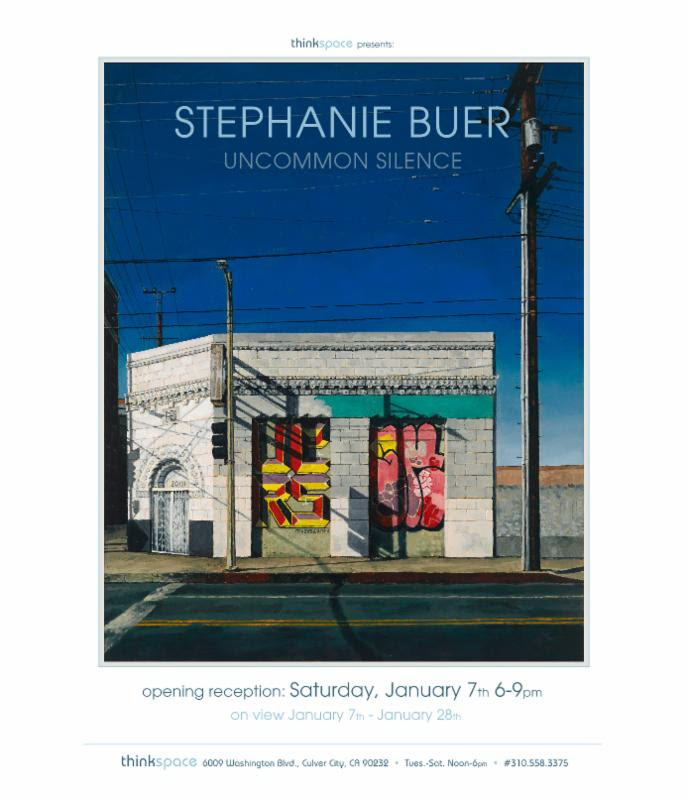 Thinkspace is proud to present Stephanie Buer’s newest body of work ‘Uncommon Silence’ in our main room this Saturday, January 7th. 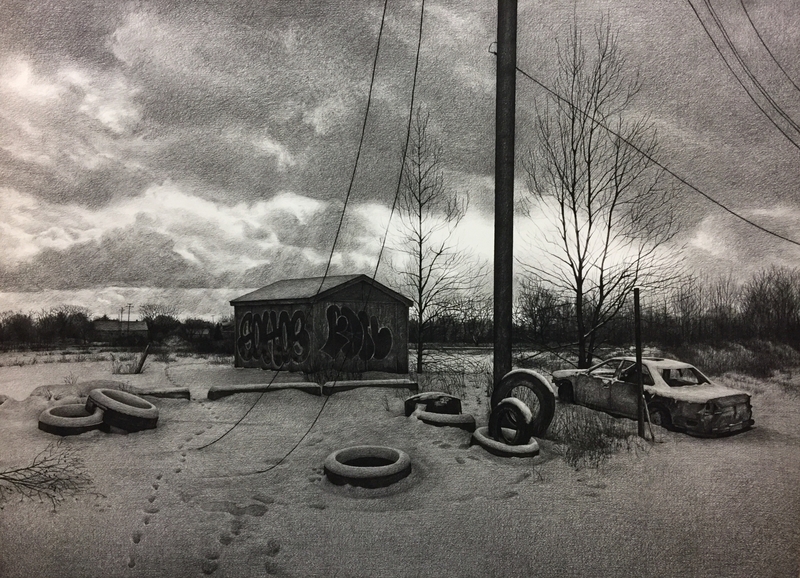 The Portland-based artist realistic paintings and charcoal drawings capture the vacant and desolate sprawl of abandoned urban spaces. 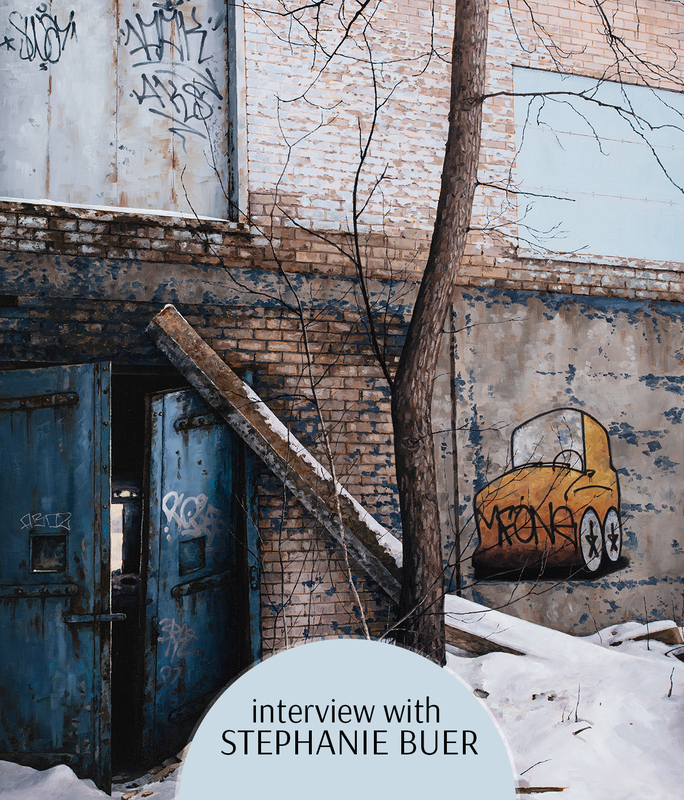 In anticipation of her upcoming exhibition with us, we have an exclusive interview with Stephanie Buer to discuss her inspiration, exploring urban spaces, a day in the studio, and so much more. Join us at the opening of ‘Uncommon Silence’ Saturday, January 7th from 6 to 9 pm. SH: What’s the inspiration behind the exhibition? SB: Los Angeles is the inspiration. We wanted to do something a little different for this show, so I came to LA for a week about a year ago and just wandered the city, looking for inspiration. It was a really great experience. SH: Can you describe your creative process? What does a day in the studio look like? SB: Once I’ve gathered all the images, gone through them and picked the ones I would like to work with, its pretty straight forward. The creative part comes in when wandering and finding beautiful places to paint and then arranging the compositions. After that, it’s just putting in the hours to get it all done. I work anywhere from 6-12 hrs a day. I bike to the studio, paint or draw for awhile, head to the gym to work out or grab a meal with friends then usually head back to the studio. I can’t work more than about 6 hrs in one stretch, my focus starts to fall apart and the work gets sloppy, so that’s usually when I take a break. SH: When not working on your art, what is your favorite thing to do? SB: I love climbing. If I’m not working at the studio, I’m at the gym climbing, at Smith Rock climbing or off in the mountains somewhere. Its so much fun, I can’t get enough. I also spend a lot of time hiking, practicing yoga and biking. I like to stay really active. SH: What is your favorite abandoned space? Do you have an interesting story to share from exploring different spaces? 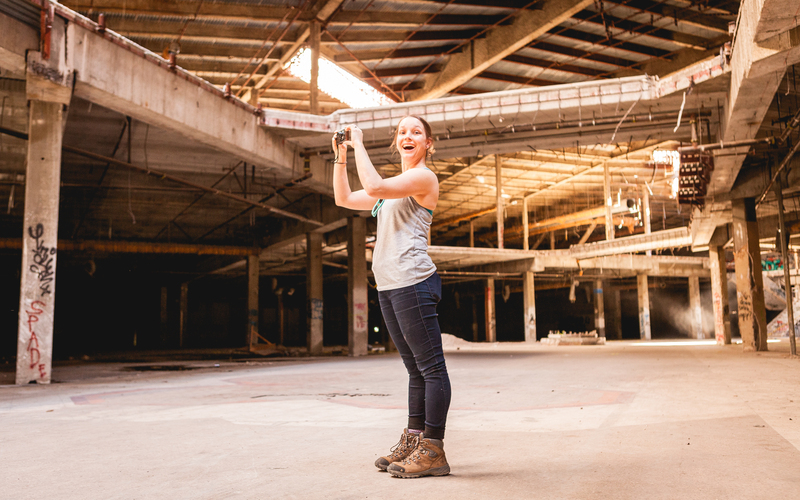 SB: My favorite abandoned building to explore is the Packard Plant in Detroit, I think it always will be. I loved that space so much, I spent a lot of time there in college, after college, I’ve been wandering that property for the past 14 years or so. I have a lot of great memories in that space. It’s being renovated now, I haven’t been in it in over a year. It will probably never be the same as it was, so I’m very happy to have gotten to know it when I did. I remember exploring that building around Christmas once and way deep in the building we found some abandoned rooms that were rented out at one time as storage units. They were filled with so many old relics of peoples lives, it was pretty sad but also exciting. We found a bunch of boxes of old Christmas decorations and we decorated the hallways with everything we found. It was very festive and cold and snowy and amazing!! SH: This question feels ridiculous to ask, but the world is one in which women have to be more on guard. 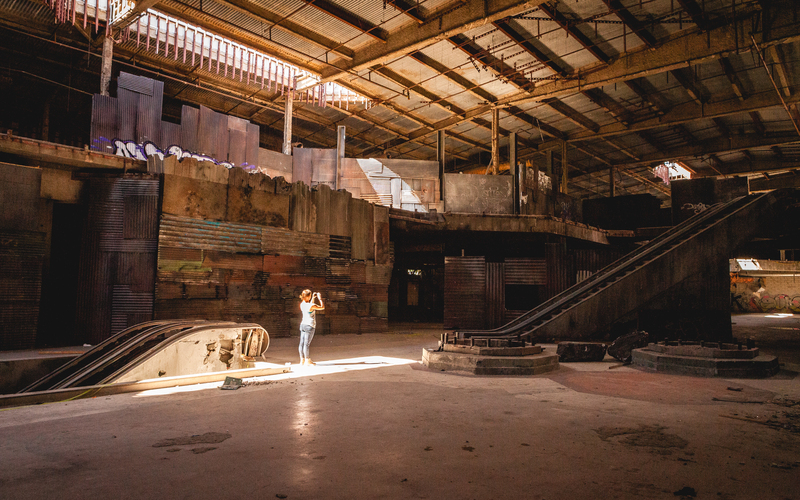 Going into abandoned spaces for your reference photos, how do your ensure you’re safe or push pass any apprehension you had about exploring these spaces. What advice would you give other female artists who are afraid? SB: I am a very independent woman and I feel very confident in my skills in the wilderness and on mountains but it’s true that in our world, you still have to be careful and be aware of unsafe situations. I never go alone, that’s one piece of advice I could give. Even if I know the space really well. These abandoned places attract people from all margins of our society including a lot of people with mental illnesses. There just isn’t the funding in this country to take care of people with mental issues and they end up on the streets and then in these spaces where they can hide and live and they’re just very unpredictable. Most are incredibly friendly and have great stories to share but you never know. Also, be aware of the consequences of getting caught, and make sure you’re cool with that before going. Most of the time I can talk my way out of things but if and when I do get caught I like to know the consequence ahead of time so I’m not surprised and then angry. We have a saying in mountaineering, the number one rule in mountain climbing is, don’t fall, the second rule is, don’t fall and the third is . . .don’t fall! I’d say the same goes for this, but it’s don’t get caught! So, go out with others, carry a knife, wear running shoes, bring nothing valuable, be aware and bring snacks! 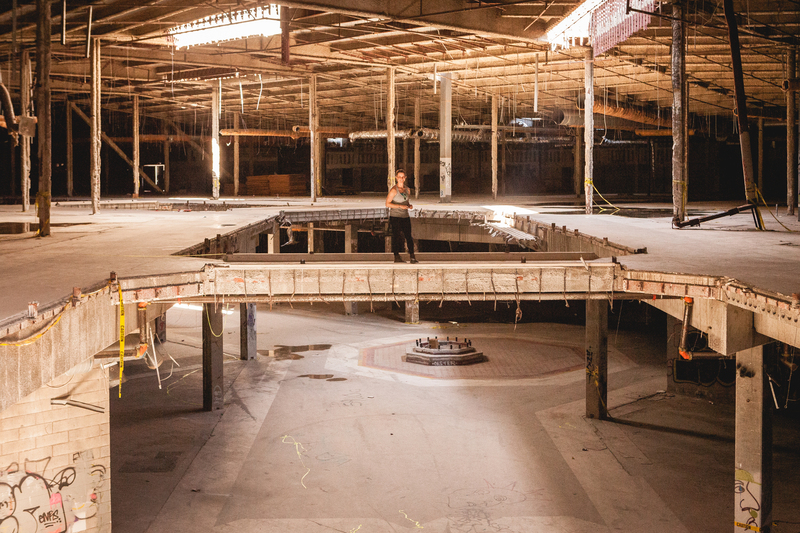 SH: In a 2012 interview you shared your love of Detroit and the Packard Plant, have you found a similar kinship with Portland or an inspiring location? SB: I have not sadly. 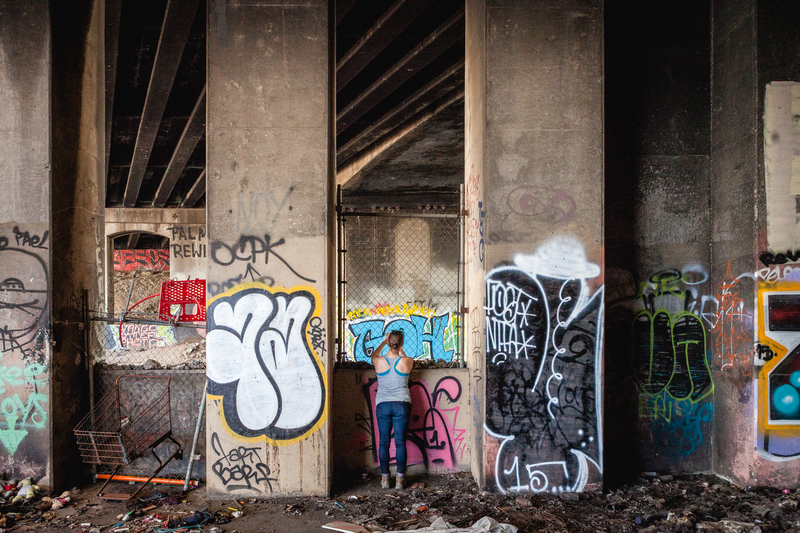 There are a few places I like to wander and as Portland becomes more popular and people start moving here, I’ve noticed an increase in the amount of graffiti which is fun. I like living here though, the creative community is amazing, lots of really friendly, talented people. I also like the easy access to climbing, hiking, and mountaineering. My family is all still in Michigan though, and always will be so its still home and I go there a lot. I think I’ll do more traveling to explore urban spaces in the future too. I had a great time wandering LA and look forward to getting to know other cities in that way. SH: You’ve shared you’re not a history buff but you have a clear fascination with the past and its influence on the present if you were to have a dinner party what 3 historical figures would you invite and what would be on the menu? SB: There would definitely be pizza, really good pizza and a couple bottles of wine. I’ve been eating a lot of pizza lately. I would love to sit and chat with John Steinbeck. One of my favorite books of all times is Sailing Alone Around the World, by Joshua Slocum. I’d love to chat with him about his adventures. I know I should probably list some painters or something like that, but painters are weird. We spend too much time alone painting and we get weird. It’s okay though. I climbed in the Bugaboos this summer and was reading these stories about Conrad Kain, a famous mountaineer from the early 1900’s, he climbed with a lot of badass looking pals, including a few ladies. I would love to sit down and hear their stories. I love hearing about people who adventured before it was made too convenient. Everything was difficult and they were so tough. SH: What excites you about other artists work? What makes you a fan and can you share a few people we should look up? SB: I really love the way people use paint. Some artists say so much with so little, and the brush strokes and light. It’s too much! There’s some amazing painters out there. I’ve really been enjoying Phil Hales paintings. I can never seem to get enough of John Singer Sargent and Andrew Wyeth either. SH: How long does one piece take to complete? Do you work on multiple pieces at a time? SB: I definitely work more than one piece at a time. I usually only do one drawing at a time but I’ll also have two to three paintings in rotation. I use a very limited palette and a lot of the building materials in the images are shared from one image to another so I can get a lot of mileage out of a well-mixed palette. I like switching back and forth between charcoals and paintings as well, they inform each other in really great ways. I’m never entirely certain how long they take though. I always forget to time it. I would guess anywhere from 40-100 hrs. SH: Kicking off the year with an exhibition seems like a solid way to start the year, what are a few of your goals for 2017? SB: It really feels great! Last year was a really tough year for me, lots of personal challenges so this feels good. I’ve been so busy the last few months, finishing up work for the show that I haven’t given much thought to my goals. I have lots of climbing goals, I’d love to go back to school and get my masters, travel somewhere new and make a body of work from the trip, there will be a lot more dancing this year, being with my family and friends . . . . after the opening I’m gonna hide in the desert for a bit, I’ll think more on it then.